White Cake from Scratch~New Version! We are excited to add this amazing new homemade recipe for White Cake from scratch to our Recipes section. 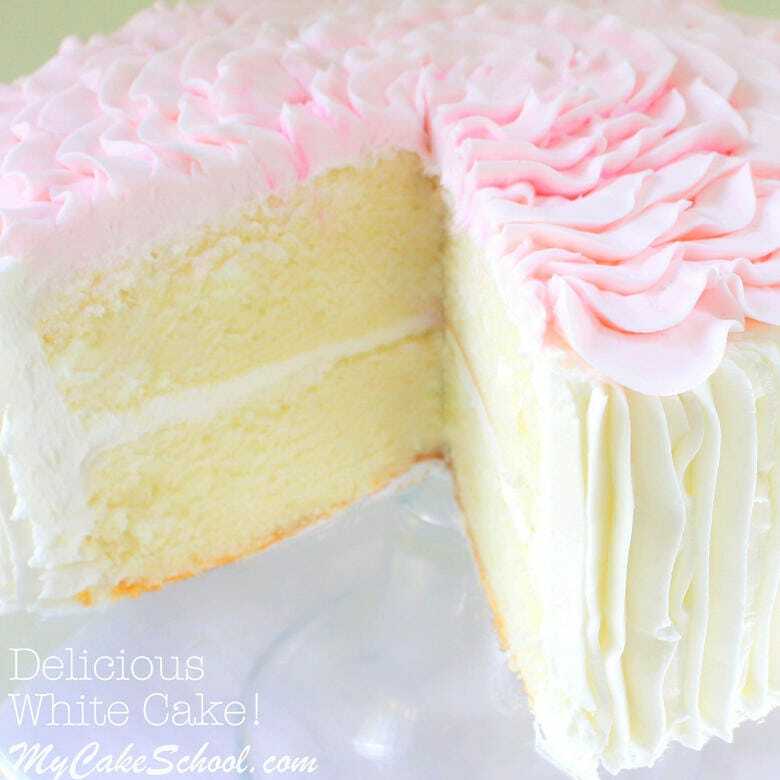 This white cake recipe is just the BEST! It is delicious, very moist, has a wonderful flavor, and holds up well to fondant. This has become a new favorite for us! Many years ago, when I first began to experiment with cake decorating, I baked with doctored cake mix recipes exclusively. They taste great, are super moist, consistent, and simple. I was convinced that scratch cakes…especially white cakes and chocolate scratch cakes were … underwhelming. 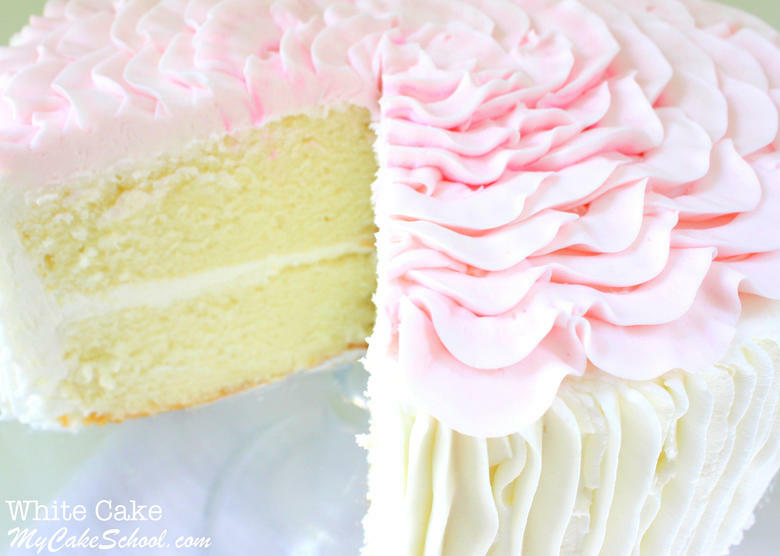 There’s nothing sadder than a gorgeous slice of cake that is dry when you take a bite of it. Well, here we are years later, and I’m thrilled to report that I just hadn’t found the perfect scratch cake recipes yet! Now I have. Super moist and delicious scratch cake recipes really DO exist and are floating around just begging to be made. Even scratch chocolate and white ones. Hooray! While I still love a doctored cake mix recipe, and we have many in our Recipes Section that you must try, we have discovered (or created) many more scratch recipes that you’re going to love as well. This classic White Cake recipe is one of them. You’ll notice that this cake isn’t a stark white. Although it does call for egg whites as most classic white cake recipes do, it also includes butter which lends great flavor, but also a slight tinge of yellow. For a stark white, you would need to go with a recipe that calls for vegetable shortening instead of butter. But for me, I don’t want to lose the deliciousness that the butter adds. This cake is fabulous! Have you heard of the Reverse Creaming Method of Mixing? With this mixing method, ingredients are added in a different order than with the conventional (aka creaming) method of mixing. The results are a slightly denser cake with a finer crumb and a more velvety texture. You can see in the photo above that this cake as a fine crumb. If you are unfamiliar with the Reverse Creaming Method of mixing and would like to learn more, you can find our link to a free to tutorial on the technique beneath the recipe! 10 Tablespoons (1 stick + 2T ) (141g) unsalted butter, slightly softened (do not microwave) I cut the butter into 1/2 inch slices onto waxed paper a short while before I need it. Mine is on the wax paper only 6 -7 minutes. It should still feel cold to the touch. If it becomes too soft, refrigerate for a few minutes. In the bowl of your mixer add the dry ingredients, sugar, flour, salt and baking powder. Whisk for at least 30 seconds so the ingredients are well combined. In a separate bowl, add the egg whites, buttermilk, vanilla and oil. Stir with a fork to combine. With the mixer on low speed, add the slices of butter a few pieces at a time to the dry ingredients. Increase the mixer to medium speed and beat until the dry ingredients look crumbly and moistened by the butter. Scrape the sides and bottom of the bowl. 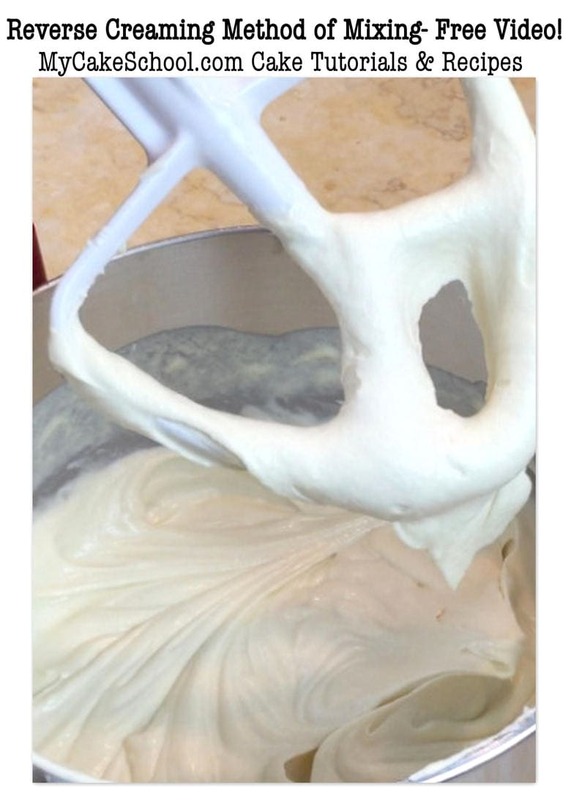 With the mixer on low speed, SLOWLY add 1/2 of the egg mixture, increase to medium speed and mix for 1 1/2 minutes, the batter will become thick and fluffy. Scrape the sides and bottom of the bowl. Add the remaining egg mixture in 2 pourings beating for 20 seconds after each addition. Bake at 325 degrees for 35 to 40 minutes or until a toothpick inserted into the center comes out clean or with just a few crumbs attached. Let the cakes cool in the pans 10 minutes, then turn out. *This recipe works well for cupcakes also, but as with most scratch recipes on our site, there is very little dome. **For more information on the Reverse Creaming Method of Mixing, check out our post and video tutorial on the method! Reverse Creaming Method of Mixing. Thanks for stopping by! 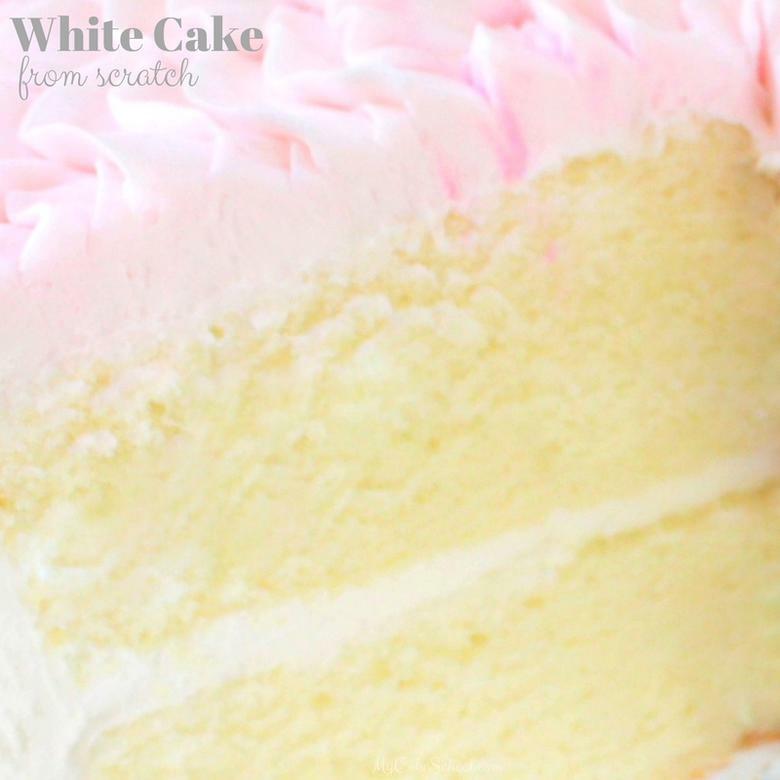 We hope that you enjoy this classic, flavorful White Cake recipe! The buttercream frosting that we used in the photo is our Classic Vanilla Buttercream, however when it comes to pairing frosting flavors with this delicious homemade white cake, the options are endless! Make sure to check out our full collection of tried and true recipes for cakes, cupcakes, fillings, and frostings in our Recipes Section! Hi Diana, The egg whites are not whipped. Using a fork they are blended with the other wet ingredients. This recipe uses the reverse creaming method. If you are not familiar with this Melissa has a video on the method, there is a link to the video below the recipe. Thank you very much. I’m anxious to try this recipe.